Right now, a glance at your newsfeed may not resemble sunshine and lollipops and rainbows everywhere. You may feel a little helpless, a little hopeless and a lot humourless (unless you’re Alec Baldwin … then you milk this for comedy gold!). 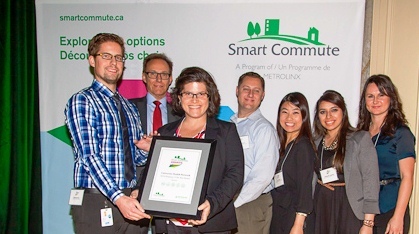 Mike Kurz , Robert Hollis (EVP PRESTO), Lisa Vanlint, Kyle Leetham, Ulrica Ho, Aneesah Luqman & Ania Ksiazek of Smart Commute Toronto-Central, Employer of the Year award. How many UHNers does it take to change a light bulb? We’ll return to this previously scheduled cliché joke format in a second, but in the meantime (cue the marching band) I’m honoured to let everyone know that yesterday at the Ontario Hospital Association’s HealthAchieve conference and exhibition UHN was announced as the recipient of Green Health Care Awards in both the Energy Efficiency and Water Conservation & Protection categories. 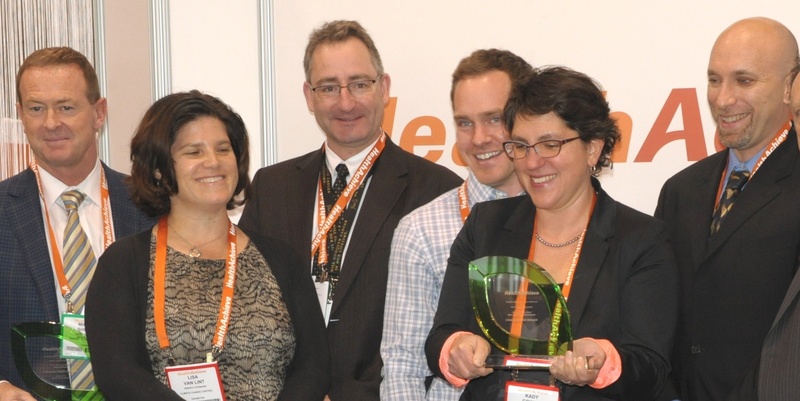 It seems like yesterday that we did a little happy dance of waste-reducing glee over the UHN silver win at the RCO awards. So what’s the opposite of adding insult to injury? Adding candy to compliments? Marshmallows to hot chocolate? Rainbows to unicorns? A Stanley to a Grey Cup? Whatever it is, we felt it when we received a lovely letter from Jim Bradley, Minister of the Environment (which makes him our absolute favorite minister), congratulating us on RCO. Was it the 3000 staff we trained this year? The 600 green team members fighting the good fight? The special outreach to Toronto Rehab Institute sites, our newer UHN family members? The blog (like the one you’re reading now), newsletters, web and all forms of Talkin’ Trash? Was it the increases in recycling and composting over icky, nasty landfill? The virtual swap room where one department’s trash becomes another’s treasure? The fancy new recycling signs that take something clear as mud and make it crystal? Whatever it was, we were happy to do it. And now that Kady’s back, we can do even more with our relatively gigantic team of 4. In the spirit of waste-reduction, especially during the holiday shopping-for-sport season, our friends at LearnStuff.com made a pretty cool infographic on the effects of plastic bags on the environment (spoiler alert…it’s not so good). We here in Toronto have had whirlwind ride on the subject, going from a mandatory 5 cent fee, to a proposed ban of plastic bags set to go for Jan 1, 2013, to no ban and no 5 cent fee. I’ve heard from many green-minded individuals that though they still try and remember their reusable bags, without the little 5 cent detractor, they’re just not as diligent. What do you think works best? Weigh in before we bag and tag the subject.